Trudy Ann’s Apple Pie Chai is another tea that I got at the 2018 Vancouver Tea Festival (oh yes, I spent a lot of time at her booth!). Surprisingly, this is a rooibos blend. I know what you’re all thinking, “But Michelle, you don’t like rooibos blends”. That’s right, traditionally I don’t. There’s just something not tasty about the medicinal-like base that straight rooibos has, and there are some rooibos blends that I enjoy. 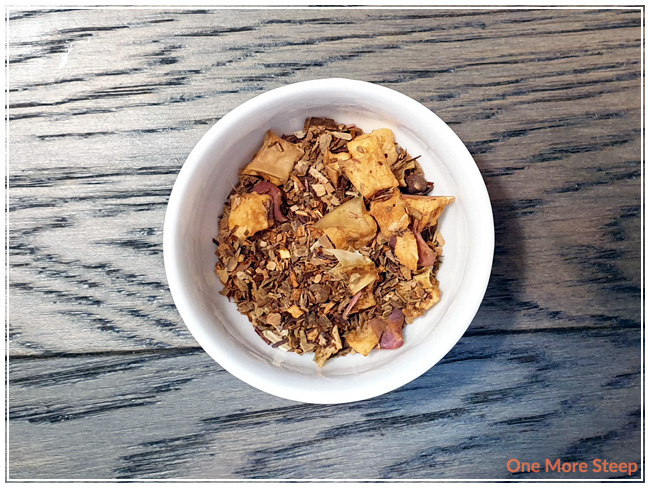 Apple Pie Chai smells pretty much like apple pie, and I can’t smell the rooibos blend – so I consider that a win overall and it makes me willing to give it a try. Apple Pie Chai consists of: rooibos, apple, cinnamon, and cloves. I think it’s the combination of the cinnamon and cloves that really makes me think about apple pie. They’re just such classic ingredients that it makes me think of that warm, autumn dessert. 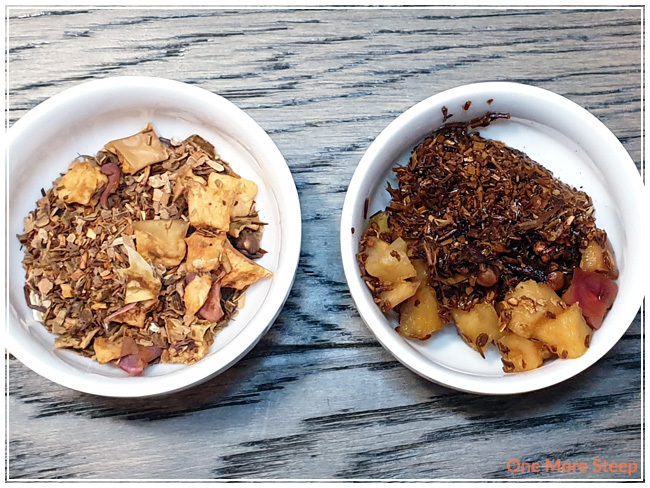 The ingredients are fairly easy to pick out, especially the very generous amount of dried apple pieces. Trudy Ann’s recommends steeping Apple Pie Chai in hot water for 5 to 10 minutes. I opted to steep with 100°C (212°F) water for 7 minutes. Apple Pie Chai steeps to a deep reddish orange. My initial steep of Apple Pie Chai was with a stainless steel infuser, and I found that a lot of the little ‘bits’ came out into the tea. If this bothers you, I’d recommend using a filter bag to steep your Apple Pie Chai for a clearer steep. I can smell the rooibos base in the steeped tea, but I can also smell the apple and cinnamon. The cloves aren’t as strong compared to the dry base. Apple Pie Chai has a thickened mouthfeel to it, and I can taste the apple and the cinnamon. A pleasant surprise I found with the Apple Pie Chai is that I cannot taste the rooibos blend – win! I attempted to resteep of Apple Pie Chai and steeped it for 10 minutes. I found that a lot of the flavours that I loved in the initial steep were quite muted, and the rooibos base is quite pronounced. 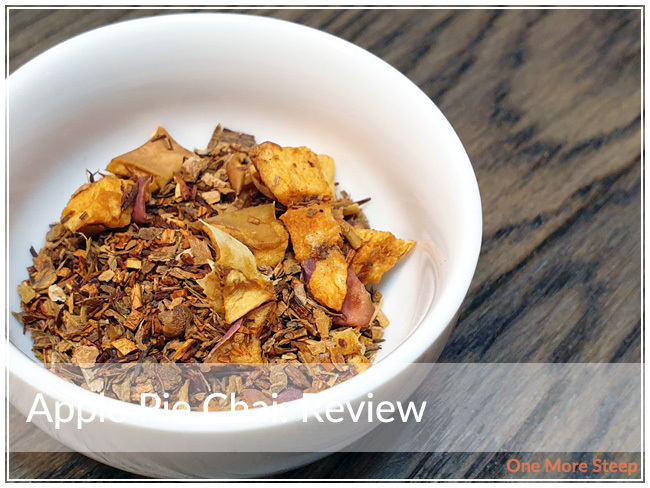 So if you love the taste of rooibos, I would recommend resteeping Apple Pie Chai. If you’re like me and enjoy the other flavours more, I would stick to one steep. 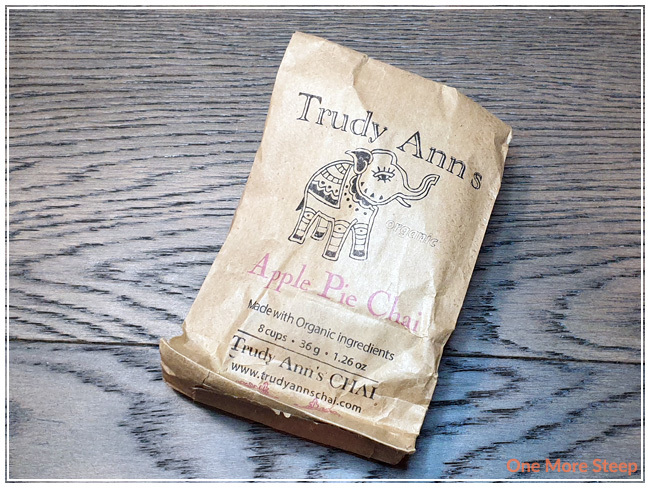 I loved Trudy Ann’s Apple Pie Chai. I love that the dry leaf and the steeped tea smells just like apple pie, it definitely makes me think of the dessert. 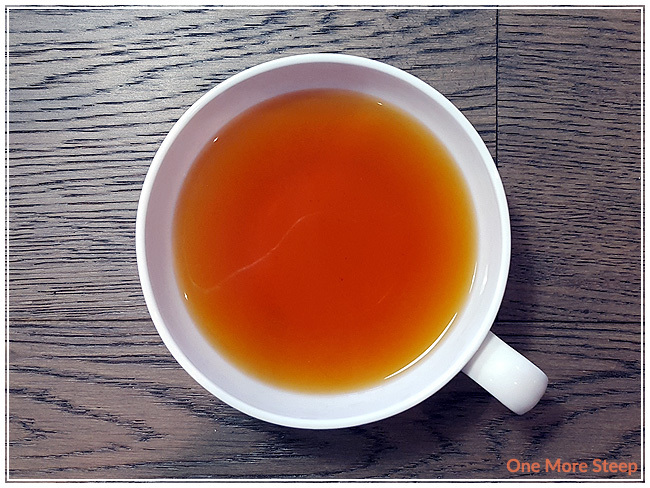 The flavour of this rooibos base are delicious, and it makes for a great caffeine-free dessert tea. If you’re not a fan of the flavour of rooibos, I would highly recommend just sticking to the initial steep. 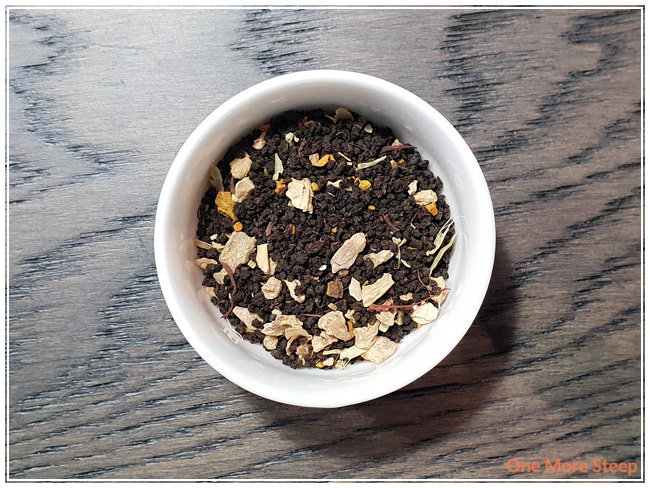 I first got to try Trudy Ann’s Kashmiri Golden Saffron Cardamom Chai at the 2018 Vancouver Tea Festival. It was one of the teas on sample and just oh-so-good. I kept going back to the booth to sample some more before I finally broke down and bought some. Kashmiri Golden Saffron Cardamom Chai comes in a kraft paper pouch that is plastic lined and resealable. When I opened up the packaging, I did wind up giving it a little bit of a shake to redistribute the ingredients, I did have it sitting for a little bit after November so some of the smaller ingredients did settle a bit. If you ever run into that issue with any of your tea blends, I recommend closing it back up and then just giving it a few gentle shakes. This helps to redistribute the ingredients and results in tea that tastes a lot closer to what the company intended! The aroma of cardamom, tumeric, and ginger are the strongest in the dry leaf of this tea – the ingredients are well represented and easily identifiable. Kashmiri Golden Saffron Cardamom Chai consists of organic: black tea, saffron, cardamom, tumeric, and ginger. Trudy Ann’s gives multiple directions of steeping – ranging from steeping in a cup, stove top, or iced. I opted to follow the instructions for a cup, which was to steep in hot water for 5 to 10 minutes and then strain out the tea leaves. I opted to use 100°C (212°F) water and steeped for 7 minutes. For the iced chai instructions, it is to steep 1tsp of tea in ½ cup of hot water for 5 to 10 minutes and then add a ½ cup of ice cubes and then pour the whole thing over vanilla ice cream. This sounds like a most excellent idea for the summer time! Kashmiri Golden Saffron Cardamom Chai steeps to a beautiful deep red with a bit of a yellow glow to it. The aroma is primarily that of the cardamon and tumeric, with a hint of the ginger in the background. The flavour of the tea is sweet, I can taste the cardamom, ginger and tumeric with just a hint of the saffron in the background. Kashmiri Golden Saffron Cardamom Chai has a surprisingly thick mouthfeel to it, it’s very pleasant and I found it to be quite smooth. I honestly think this would be so good as a tea latte, it’d be a pleasant mix of golden milk (tumeric + milk) and a chai latte. The packaging of Kashmiri Golden Saffron Cardamom Chai includes instructions for a second steep, which is to steep for 10 to 15 minutes. I opted to steep for 12 minutes and found that the resteep was very tasty. It lacked that thick mouthfeel that I found in the initial steep, but the flavour profile was still very similar to the initial steep. 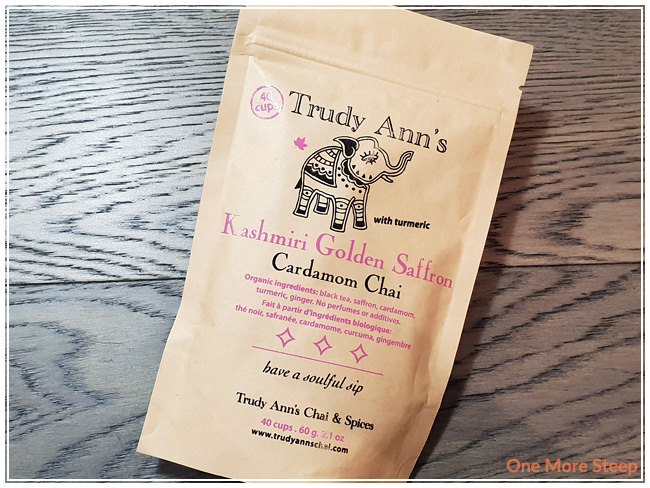 I loved Trudy Ann’s Kashmiri Golden Saffron Cardamom Chai. I found the balance of flavour between the cardamom, ginger, and tumeric to be so well balanced, it made for just such an enjoyable cup of tea. 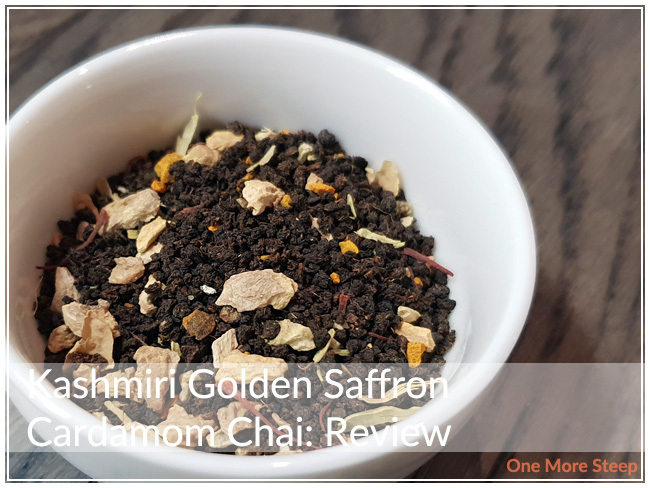 The hint of saffron, which played quite nicely with the heavier flavours of the spices, just made this tea feel a little bit luxurious to smell, steep, and drink. And for anyone who’s frowning heavily at the cost of a bag, which I honestly did when I first thought about buying it until I realized I drank a dozen small cups worth of samples – it works out to be $0.55/cup which is so much cheaper than a tea to go at a local coffee shop and with more expensive & delicious ingredients! 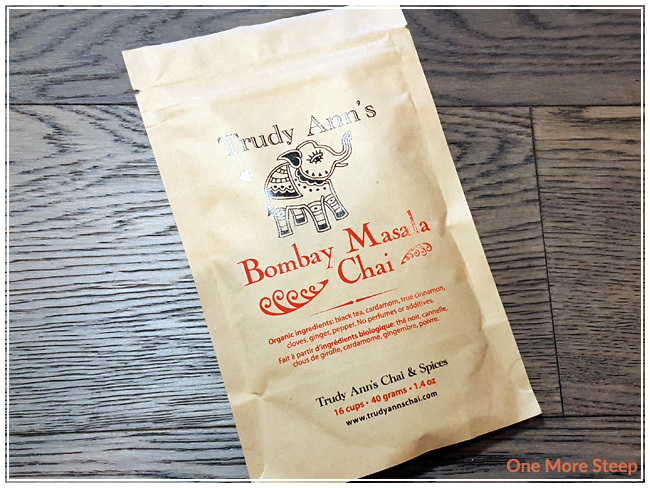 I first met Trudy Ann at the 2017 Vancouver Tea Festival, which is also where I made my first purchase of her Bombay Masala Chai. She’s a complete sweetheart, if you ever have the chance to interact with her at one of the shows or markets that she sells at. Now, onto the tea! Bombay Masala Chai is made up of: black tea, cardamom, true cinnamon, cloves, ginger, and peppers. Inside of the kraft paper bag, you find black tea and a small pouch of ground spices. The instructions on the back of the packaging tell you to store the spices in a separate jar. The aroma of the spices is really inviting, I can definitely smell the cardamom, ginger, and cinnamon – those are the stronger aromatics so they’re the most obvious. The black tea smells like an assam (which, according to the product page on Trudy Ann’s website, it is). Trudy Ann includes directions for steeping this tea in a cup, on the stove top, iced, and how to resteep it. I’ll discuss the directions for steeping in a cup since that’s what I did. 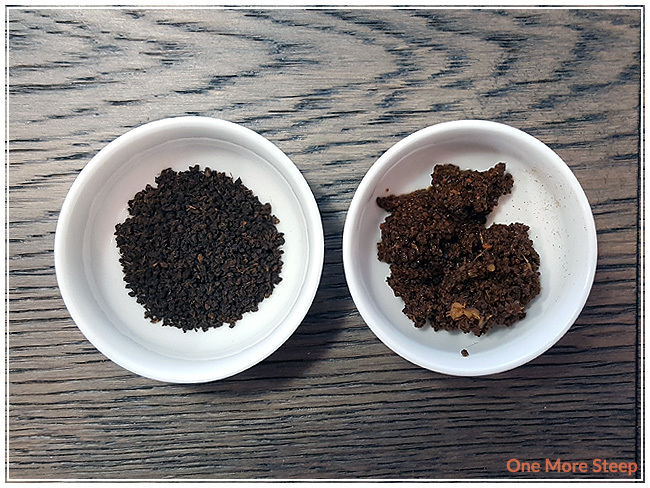 Trudy Ann recommends adding 1 tsp tea and ¼ tsp chai masala (spices) to 1 cup of boiling (100°C/212°F) water, and to steep for 5 minutes prior to straining. Then, you can add cream and sweetener to tastes. 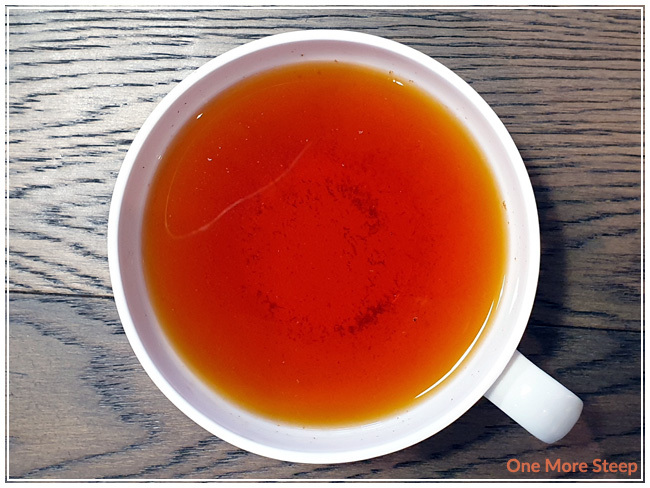 For this review, I followed the steeping instructions and tried it plain. 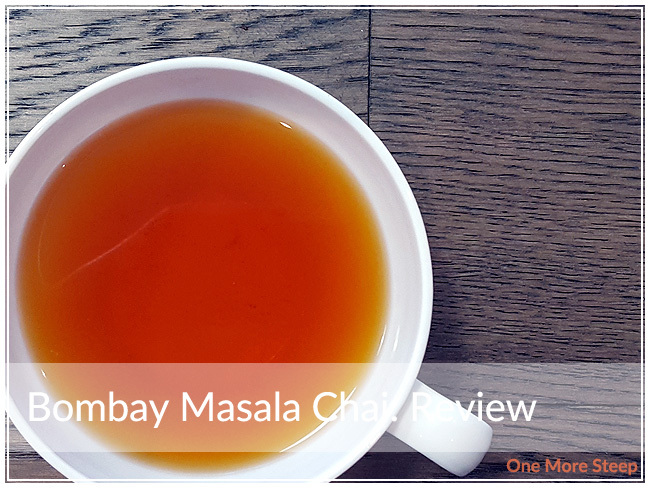 Bombay Masala Chai steeps to a beautiful golden orange and has a lovely aroma that comes up from the tea. You can definitely smell the cardamom and ginger, and I love those aromatics. The tea itself has a nice sweetness to it, and the combination of spice to black tea is well balanced. 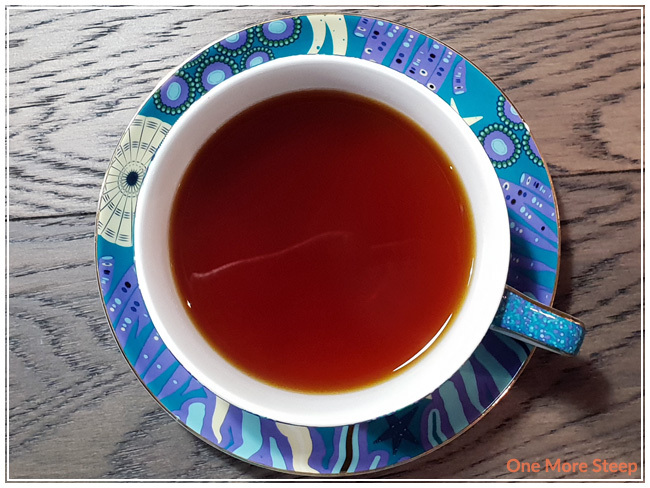 I enjoy the fact that it’s not too spicy – if you’ve ever had some chai blends, you might know what I’m talking about when the spices overwhelm the black tea base or when one spice just covers up the rest of them. Bombay Masala Chai has a nice balance though, I can taste the black tea, as well as the different spices. Trudy Ann’s recommendations for a second steep is to double the steep time (from 5 minutes to 10 minutes). I found that at 10 minutes, the first resteep is fairly similar to the initial steep. It’s not as sweet as the initial steep, but that’s something that can be easily remedied with a bit of sugar or honey. I loved Trudy Ann’s Bombay Masala Chai. 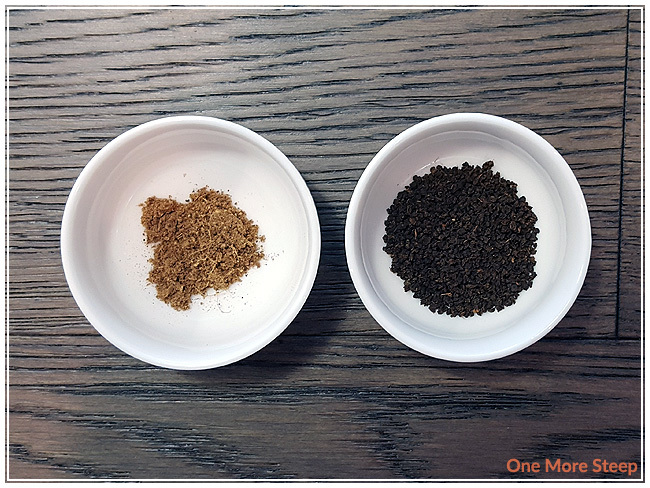 If you’re a fan of chai but struggle to get the spice to tea balance right (like me! ), I would recommend giving this blend a try. I love that the spices are right there and you can control how much you put in. 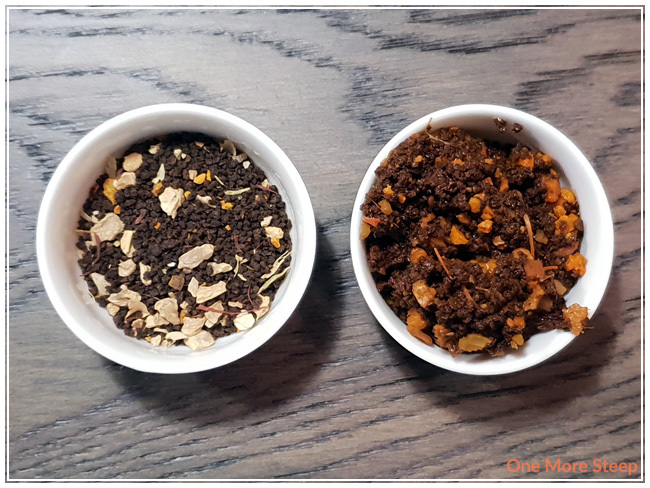 You can smell the ingredients, there’s clear instructions for making the tea whatever way you want, and the flavours are just so well balanced against each other that it’s enjoyable and there’s not just one spice that’s overwhelming the rest.